The promise of supporting the prospects of a President of Igbo extraction in 2023 by the All Progressives Congress, APC, has been widely dismissed as deceptive by Igbo leaders. They particularly described it as a ploy to get the region to support President Muhamadu Buhari’s perceived second term ambition, adding that it was not in the interest of Ndigbo. Though the calls to support the party, which APC leaders described as the surest path to Igbo Presidency, sounded simplistic, Igbo leaders said the interest of the zone was not guaranteed in the APC. Consequently, they told news media on Saturday , that they would mobilise the Igbo against what was labelled as the deceptive antics of the APC. 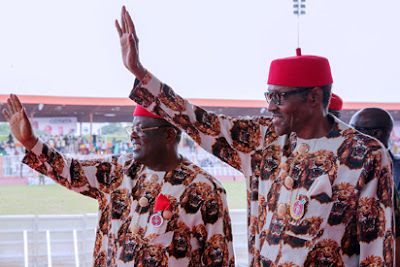 Saturday left observation that many in the zone viewed the President’s visit to Ebonyi State last Tuesday and his speech as the latest in the series of moves aimed towards attracting Igbo support ahead of the 2019 poll. The six-month regime of the late Major-General Johnson Aguiyi-Ironsi was the only time the Southeast governed the country, as the late Dr. Nnamdi Azikiwe was only a ceremonial President in the Balewa government. Ndigbo should be careful of APC—Eya A former Secretary-General of Ohaneze, Chief Nduka Eya said: “Let them stop deceiving the Igbo. I want the Igbo to know that the APC can’t give us 2023 presidency. The Igbo can only get it with a two-third majority, not through the promises being made by the APC. The party thinks that Buhari’s presence in the Southeast will make the Igbo vote for the APC in 2019. That is not possible, except they rig the election. The Igbo are wiser now. Those people talking about supporting the APC so that we can have Igbo presidency in 2023 should forget about it. ‘’APC cannot be trusted. We are not even interested in it now, what the Igbo need is to put their house in order. We have the Deputy Senate President and Ohaneze leadership, who are expected to use their positions to rightly put our house in order. “They should stop deceiving themselves. My message for Ndigbo is that they should not take that bait. When the party was campaigning for election, they promised to revive the coal corporation in Enugu. But we have not seen anything except a visit by some officials. We have terrible roads and they are not interested in any meaningful project in Igbo land. They can’t destroy the Igbo. They tried it for three years and it did not work. The former Eastern region was split by (Yakubu) Gowon to break the solidarity that existed in the region but we are still in tandem with the Efik, Ibibio and other tribes that made up the former Eastern region. The Igbo should not take that bait from a party that promised so many things and did nothing. What is the assurance that they will be committed to the promise when they are re-elected? That is even the time Buhari will tell the Igbo to go to hell because he will not be seeking re-election. Traditional rulers erred by giving Ochiloha title to Buhari “I am also critical of the traditional rulers that gave him the title of Ochilioha of Ndigbo. They cheapened themselves with that action because the Igbo don’t even have a common title. For instance, if the Obi of Onitsha decides to give him a title, such title is for Onitsha and not for the entire Igbo. Even though Ebonyi State governor has endorsed him for a second term, Buhari cannot win in the Southeast. “When the President visited the Southeast, I made a statement on Urban Radio where I hailed him for coming. I told him that we love him but are being careful of the Greek Gift he brought. APC promised change but they have spent three years blaming Jonathan and PDP. Buhari said he belongs to nobody but we have seen where he belongs to by the virtue of the appointments he has made. No Igbo person will believe APC—Ohaneze Youth Council Also speaking, the Secretary-General of Ohaneze Youth Council, Mazi Okwu Nnabuike said: “They are deceiving Ndigbo. Anybody, who believes them, is deceiving himself. Igbo man was online for SGF but they did not do eventually consider that. We all saw how Ogbonnaya Onu was schemed out. When the God of Ndigbo created a vacancy in that position, they did not appoint an Igbo person. APC cannot be relied on. We know their ways. And that is why we are resisting their deceptive moves. APC doesn’t even recognise the quota system in the Federal Character Principle. APC should not be trusted in any election—Ezeife A former governor of Anambra State, Dr. Chukwuemeka Ezeife said: “APC should not be reckoned with in any presidential election whether it is 2019 or 2023. Igbo people have made up their minds. When we see Buhari and the list of candidates running for the presidency we will know what to do. As it is now, it doesn’t appear he will be a candidate. Why are they making noise about it? “The issue is that they have blown their chances. They have no chance of producing the President again unless through rigging.’’ Ndigbo are wise, would be wiser in 2019—Ohaneze Also, National Publicity Secretary of Ohaneze, Mr. Uche Okpaga said: “The statement is puerile and pedestrian. There is no substitution for good governance. Ndigbo will vote according to their conscience. We have stated timelessly that Igbo Presidency without restructuring is not feasible. The performance of the government will be the yardstick, not political statements made to hoodwink the people. Ndigbo are wise and would be wiser in 2019” Buhari not in a position to handover power in 2023—Chekwas Okorie National Chairman of United Progressive Party, UPP, Chief Chekwas Okorie said: “Those making the call and promises can go and say that to the Marines. President Buhari ran for the presidency four times consecutively before he got it without waiting for any party to zone it to his zone. The Ohanaeze people and Igbo APC leaders that said that Igbo will get the presidency in 2023 after supporting Buhari, missed it. I was very ashamed of that comment from an Ohanaeze led by an erudite politician like Chief John Nnia Nwodo. “ Whatever President Buhari thinks he can offer, there is no chance for him to come back in 2019. He is a one-term President. The Consensus in Nigeria now is the need for restructuring and true federalism. Since Buhari is not in support of what most Nigerians want, he is not in a position to be re-elected in 2019. He is not even in a position to hand over power to anyone in 2023. “Dr Paul Unongo at the Zik lecture in Lagos urged Igbo people to step forward and contest election in 2019 and not wait for anybody to zone the presidency to them. LET’S WAIT FOR A CONCRETE PROMISE – UZODIMMA. I know that Igbos are looking forward to producing the next Nigerian President after the North has completed its tenure. However, the question whether Igbos will support President Buhari for Presidency in 2019 if he promises to support the Igbos for the Presidency in 2023 is speculative. To the best of my knowledge, President Buhari has not made any such promise or commitment. The much I know of the President is that he is a man of integrity and he is a very honest man, if he makes a promise or commitment he is bound to keep it. But like I said, I am unaware that he has made any promise in that direction so there is actually nothing to react to. There is no need to be speculative. I am sure that when there is a concrete proposal on ground, we can react to it. For now, there is nothing on ground. So all I can say is that if we ever get to that bridge, we will know how to cross it. The shortest distance to Igbo presidency is APC—Igbokwe The Publicity Secretary of the APC in Lagos State, Mr. Joe Igbokwe, however, disagreed with those, who dismissed his party’s promise to Ndigbo, saying that supporting the APC in 2019 was the only way to get Igbo presidency. He said: ‘’Supporting APC in 2019 to get Igbo presidency is the way to go. I have been preaching and talking about it. And this is the time for it. If our people must stop complaining about marginalization, this is the time to play politics. For other people to vote Ndigbo, they must vote for APC. ‘’We need to build the connection and the time is now. No Igbo man has ruled this country since Aguiyi Ironsi led regime. Since that time, no Igbo man has played good politics. We should not miss this opportunity. ‘’Politics is a serious game. If the Igbo do not play politics well, they will die. The shortest distance to Igbo presidency is APC. By 2023, a northerner, President Buhari would have completed his eight years and an Igbo man will easily come in. ‘’APC will zone the presidency to the Southeast. We need to give the Igbo a sense of belonging. Every group is important, especially the three ethnic groups. We (Igbo) marginalized ourselves. When in 2009, Jonathan took over, we expected him to step down by 2011, but he did not. Our people went behind and supported him and he won, which made the North not to complete their tenure. APC is the epicentre of Igbo politics.’’ Similarly, the Chairman of Southeast caucus of Inter-party Advisory Council, IPAC, Chief Emeka Okafor, said: ‘’It is a good thing to support him if he sacks all those questionable characters in his cabinet. He needs our support. He has to do something serious to get the support of Ndigbo. We are ready to support him but he has to work hard to convince us. Elder statesman, Chief Ben Ezeibe, said “He has seen that he cannot move forward without Igbo people.